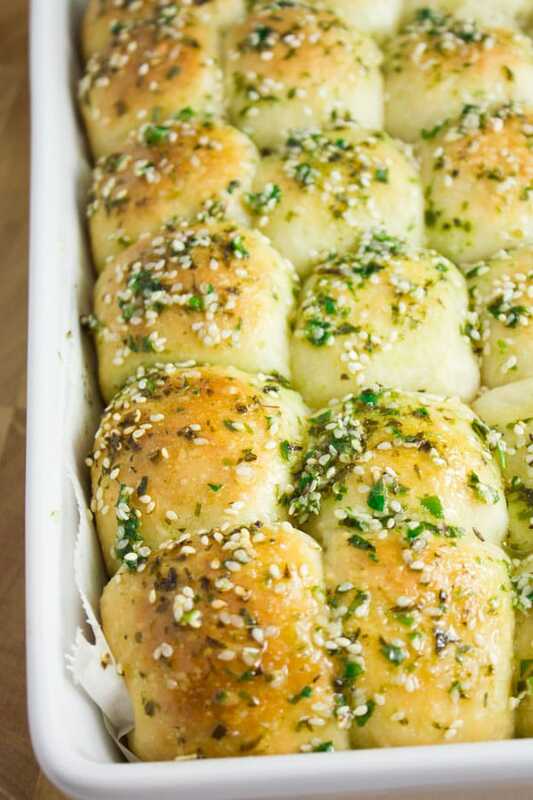 Make these Homemade Dinner Rolls once and you will never reach for any other bread recipe! 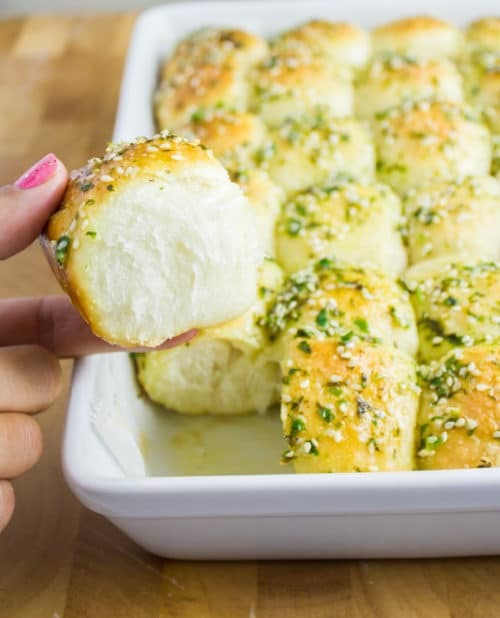 These are soft, pillowy, fluffy and you can season them with different herbs, cheese, or spices to get a completely different flavor every single time! The easiest and most versatile bread dough out there! These Fool-Proof Homemade Dinner Rolls are extremely light, fluffy and melt-in-your-mouth soft rolls with just a touch of butter. 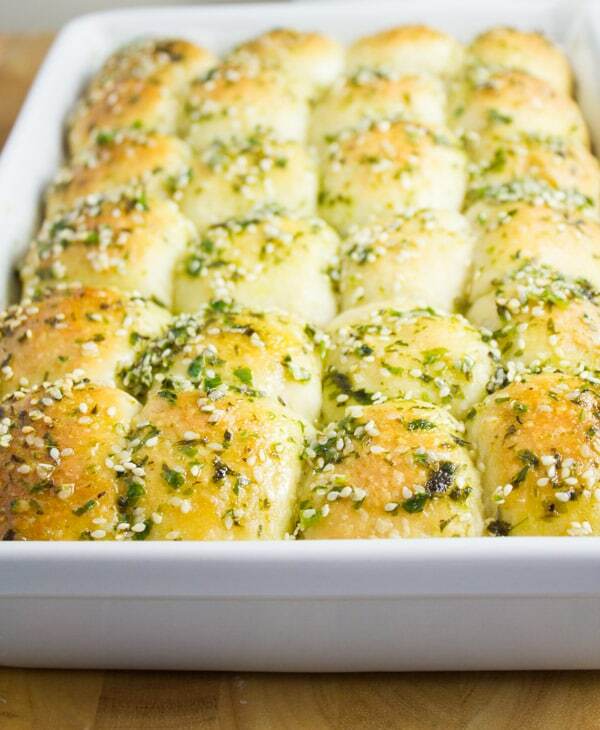 I try to make them with different toppings every time and this version is brushed with an herb-sesame-butter. The dough is very versatile and forgiving so you can’t ever mess it up. 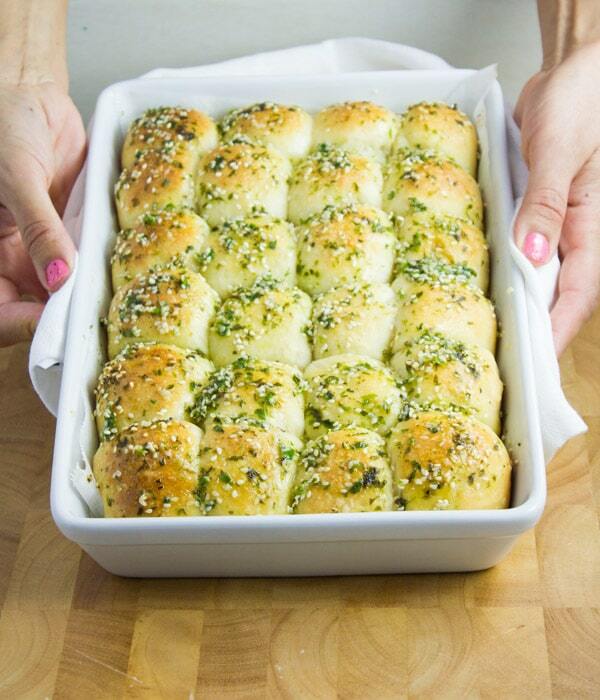 Get in your baking zone and let’s make homemade dinner rolls! Honestly, I have zero holiday plans this year. I’ve had a hectic fall season and I really need to give myself a break. For some reason, the cooking classes were simply crazy and we also just moved to a new neighbourhood. As it turns out, it’s quite a busy and social neighbourhood. We’re loving it so far, even though my little one had a bit of trouble adjusting to the new school. So bottom line, after Thanksgiving I’ll probably just bake cookies, make soup and these homemade dinner rolls for the Holidays..and that’s it! Really, I can’t count how many baking books I have read, how many doughs and loaves of bread I had to make to finally get the “feel” of the dough irrespective of the recipe. What I have learned is that SOME recipes are truly forgiving and fool proof—which is a great starting point for baking beginners. That’s where these homemade dinner rolls come in. You’ll make them, they’ll be awesome and you’ll be super proud of yourself! If you’ve been following the blog for a while, you might have noticed, that I made these best soft burgers buns recipe using the same dough. 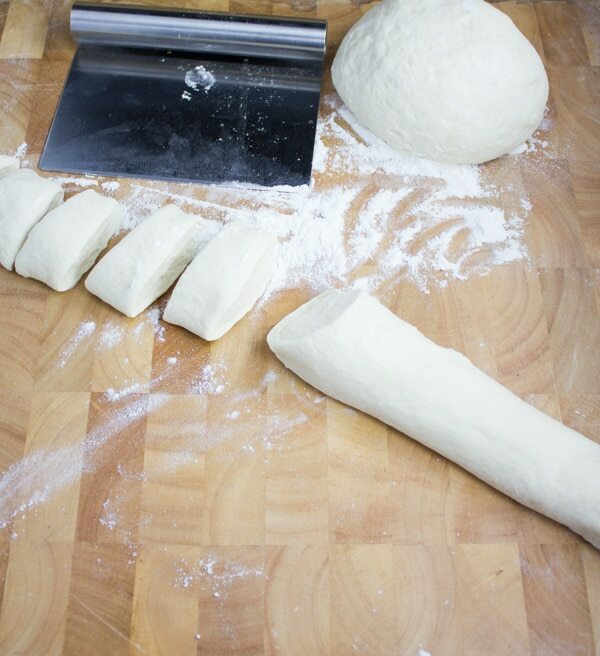 Guess what, this dough is so versatile, you will learn the recipe by heart in no time! Seriously, the dough for these homemade dinner dolls makes perfect burger buns, hot dog rolls, soft sandwich bun, the BEST monkey bread (sweet or savory), best garlic knots, soft breadsticks, cheese sticks – you name it! And of course the BEST homemade dinner rolls. The dough is basically using cold butter—a technique I’ve tested and loved over the years, and I use it in this easy flakey pie dough, a few cakes, cookies and bread. There’s step by step photos for this dough in this best soft burger buns so please look at it. Basically, it starts with cold butter mixed with flour. Then the yeast is mixed with sugar until it starts to foam up. Now you’ll add the yeast mixture to the flour, and an egg. The key here when you mix the dough is to leave the dough a bit sticky—so it should stick to your fingers when touching the dough, but it should not stick to the bowl or counter. The dough for these homemade dinner rolls should rise for about 2 hours and then I divide the dough into 2 halves and roll each part into a long rope, then slice off inch size pieces. 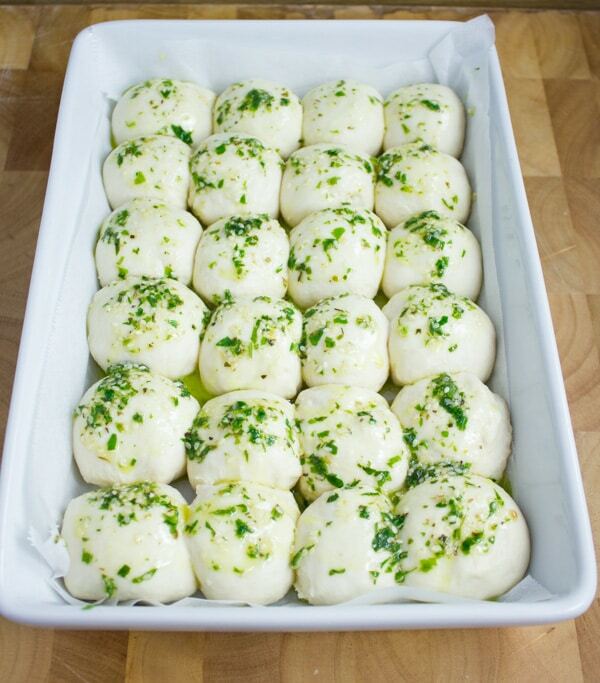 I roll each piece in to a ball and place it in an oven safe pan. At that point, the dough needs to rise again for 30 mins. 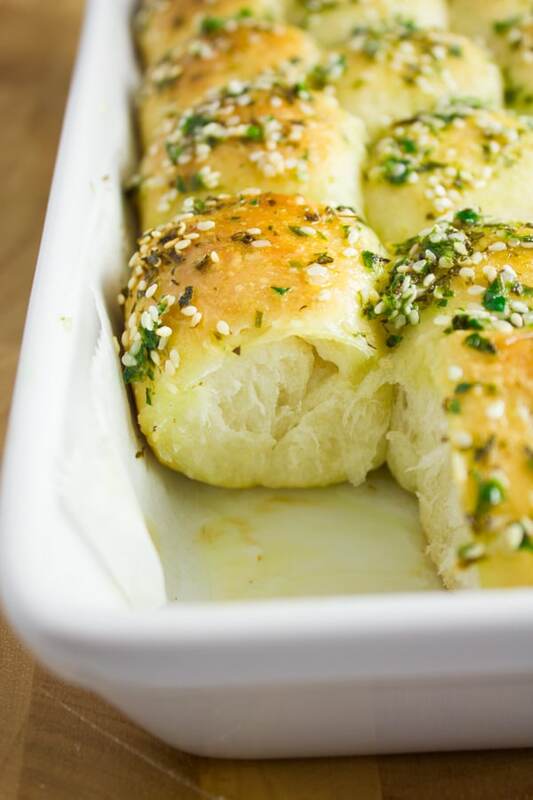 For extra flavor, I brush the unbaked dinner rolls with a butter-sesame-herb mixture before baking them. 30 mins of baking and your homemade dinner rolls are done!! When it comes to the toppings—I really jazz things around. Pure simple butter is a classic, and it rocks! 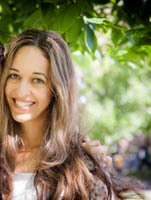 I will give you more options in the tips section! When your dough is slightly sticky to the touch but does not stick to the bowl, you have reached the perfect consistency! For a lower-cal version, ditch the butter and dust the tops of your dinner rolls with some flour. Other flavor combos are butter and cheese, butter and garlic powder, fresh garlic and cheese, butter and pesto, minced feta and spinach, orange, rosemary and onion salt.Seriously I’ve done them all. They’re all amazing—and it’s because the dough is amazing! 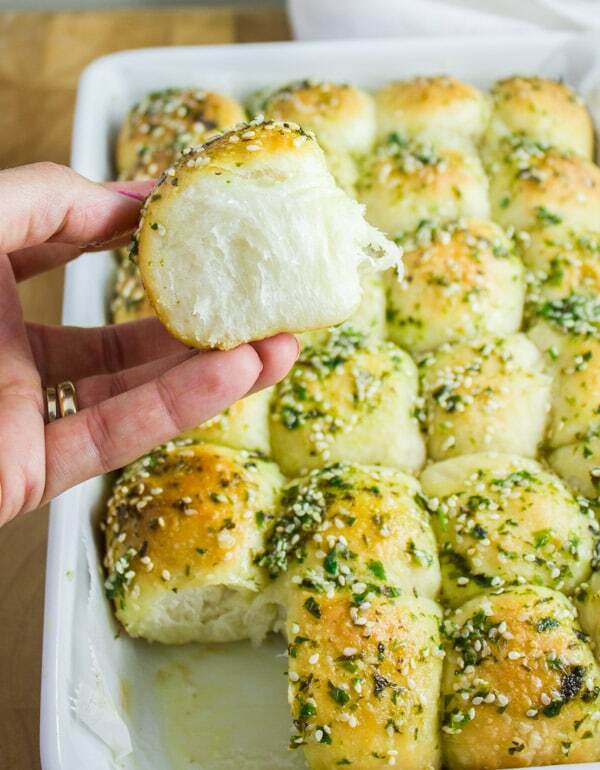 Make these Homemade Dinner Rolls once and you will never reach for any other bread recipe! 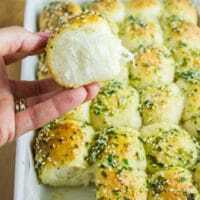 These are soft, pillowy fluffy and you can season them with different herbs, cheese, or spices to get a completely different flavor every single time! 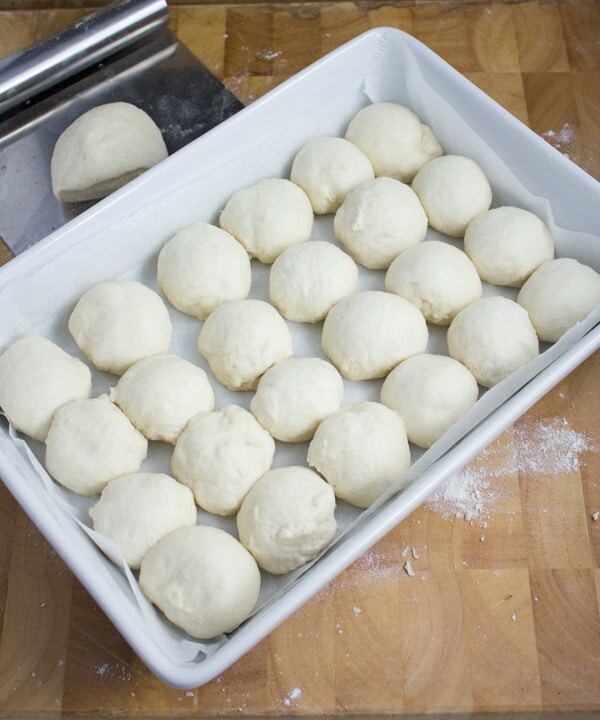 The easiest and most versatile bread dough out there! Put the flour and salt in a large mixing bowl. Rub the cold butter into the flour until the butter starts to incorporate into the flour totally. Set aside. In a measuring cup, measure the water and add the sugar and yeast to it. Mix them up and wait for 2-3 minutes until the yeast starts to activate: the mixture will turn cloudy and may foam on the top. After that, add in the egg and mix it well. Pour the yeast mixture to the flour mixture and begin kneading the dough in a mixer or by hand, for just a few minutes ( 4-6 minutes) until smooth but just a little sticky when you press your finger deep into the dough. Add a little extra flour if you feel the need to, but hesitate to add too much. It might feel challenging but it needs to be worked fast (if by hand) until it doesn’t stick to the surface anymore. Place the dough in an oiled bowl and cover it with plastic wrap. Let it rise in a warm, dry place ( like inside your oven while it is shut off). It may take 1-2 hours depending on how warm your home is that day. You will see it double in size and that’s how it’s ready. Remove the dough from the oven and preheat it to 350 degrees. In the meantime shape your dough to your desired size and thickness, and cover it back with plastic wrap for another 30 minutes while the oven is preheating. Brush the tops of the rolls with the butter mixture. Bake in the oven on a middle rack for 30 minutes (depending on the size of your rolls) until nice and golden. Once the rolls are ready, brush them with extra butter mixture. Hi, can these be made in advance and re-heated or defrosted? Or can just the dough be made and then baked a day later? Hi Jayme, yes of course! You can either make the dinner rolls and bake them, and as soon as they cool down, tightly wrap them (plastic wrap and foil) and then freeze them. Defrost either on the counter for 1 1/2 hours or in a 350 degree oven (covered with foil) for 10 minutes. If you make the dough, you can keep it in the fridge for unto 3 days MAX and then you’ll need to bake it. 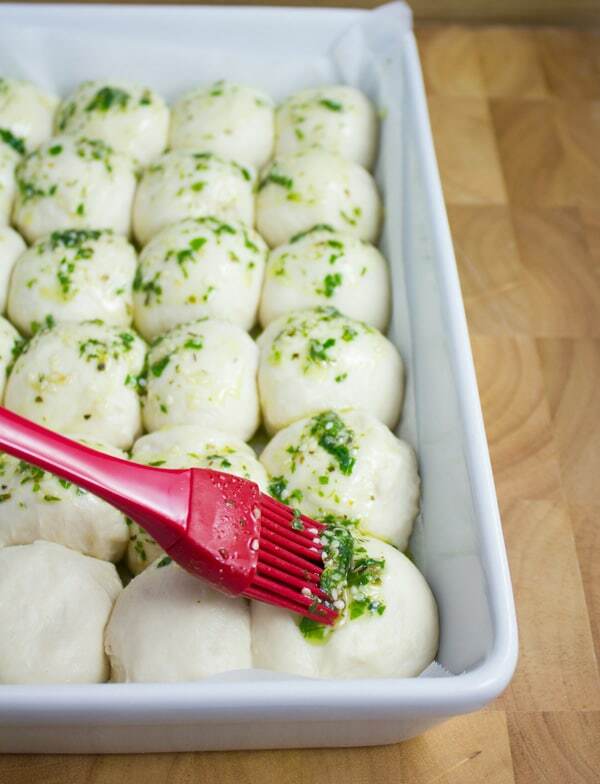 Or you can shape the dinner rolls and freeze the tray (raw dough) double wrapped in plastic and foil. To bake them you’l need to defrost the rolls for 3 hours and proceed to baking. Hi Vicki, I used a combo of parsley and oregano for the herbs 🙂 Hope you make them soon!! These turned out really biscuity for me. Any ideas on what I did wrong? They were fantastic biscuits though! Hi Holli 🙂 I’m so happy you made those rolls! I think you might’ve over-baked the rolls to get that slight crust on them with the soft fluffy inside so they felt like biscuits! I suggest bake them less next time 🙂 Enjoy! OMG sorry for that, I just fixed it!! Adding it with the egg is fine, hope you enjoyed them! How many rolls does this recipe actually make? Found your recipe on Pinterest and tried it yesterday, it turned out wonderful, although I needed to add quite a bit more flour. It would be helpful if you added a suggestion on what size of rolls and oven tray you used. Mine ended up being way too big for the tray ? I use a 9 X 13 inch tray and shape my rolls into an inch size balls, so after proofing and baking, they end up being about 2 inch rolls.